If you believe the companies developing automated vehicle technology, driverless cars could be on the market as soon as 2021. It will probably take a lot longer than that for real autonomous fleets to operate in cities, but government agencies are already anticipating how to handle the driverless car future. On Friday, the New York City Council transportation committee got in on the action. While it may seem premature to plan for driverless cars, the interests involved are already staking out positions that will have implications down the line. Friday’s hearing was a chance to see what the autonomous vehicle lobby wants from local government, and how the city wants driverless cars to fit into its transportation system. At stake are not just the myriad public safety implications of putting computer-driven and possibly networked vehicles on city streets, but also the effects on motor vehicle traffic volumes and the footprint of private car parking. New York state law currently prohibits driverless vehicles from operating on public roads, a cause for concern for Council Member Dan Garodnick. David Strickland, a former chief of the National Highway and Traffic Safety Administration and a lobbyist for the “Self Driving Coalition for Safer Streets,” whose members include Google, Uber, and Ford Motor Company, said the city needs a “thoughtful and consistent regulatory regime” if it wants to be at the forefront of testing and advancing the technology. Strickland never articulated why it would be advantageous for New York City to be an autonomous vehicle leader, however, other than the fact of being ahead of the pack. 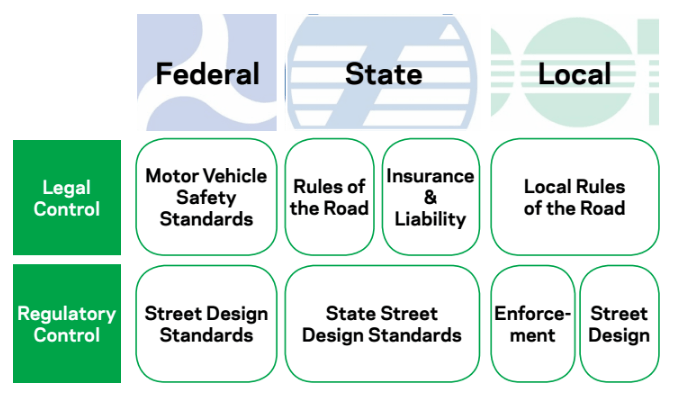 Is New York better off setting a template for autonomous vehicle regulation before other cities? Or would it be preferable to learn from other cities’ mistakes first? City officials, for their part, want to make sure the technology is proven before the vehicles are tested on NYC streets. I would prefer to see these resources deployed in planning New York’s car-free future. Oh great, another thing for De Blasio and Cuomo to fight over. Politics is fun. Except that these vehicles are coming, and we don’t have the option to stick our heads in the sand and not plan for their impacts. Many cars now ‘know’ the speed limit of the particular street, and display it on the dashboard. How about making the car incapable of exceeding this speed? It would be a good start. But if NYC were car-free, they would have zero impact. So planning for NYC’s car-free future is indeed a viable option. Driverless cars may not be ready for city streets in the immediate future, but some of the world's biggest companies are betting on them. Cities will be better off if mayors band together instead of negotiating solo with each corporation, says Zipcar founder Robin Chase. If they don't play their hand well, she warns, the introduction of autonomous vehicles will lead to more pollution, more congestion, and more demand for parking.